Increasing demand for faster processing and improved performance have generated new challenges in both digital and RF printed circuit board designs. Replacing discrete resistors on the surface of an electronic assembly improves signal routing, resulting in improved line impedance matching, shorter signal paths, reduced series inductance, elimination of inductive reactance, and reduced EMI, crosstalk and noise. SMT solder joint reduction improves reliability and shortens time to market. TCR® is a next-generation thin-film resistor foil that meets the ever-increasing challenges of packaging high-speed, high-density electronic devices. Manufactured using a thin-film vapor disposition, TCR ensures the best uniformity of resistor material across the sheet for higher yields and improved resistor tolerances in multilayer organic packages. It reduces form factor, increases the space available for active components, reduces weight and improves performance. Used with existing printed circuit fabrication processes and chemistries, TCR minimizes or eliminates additional equipment needs and shortens learning curves. Availability: TCR is available through Ticer as a thin-film material, or through global material suppliers as a laminated product. Compatibility: TCR is profiled and tested with a wide variety of resin systems, including standard, high performance, lead-free and specialty resins. It is also ROHS compliant. 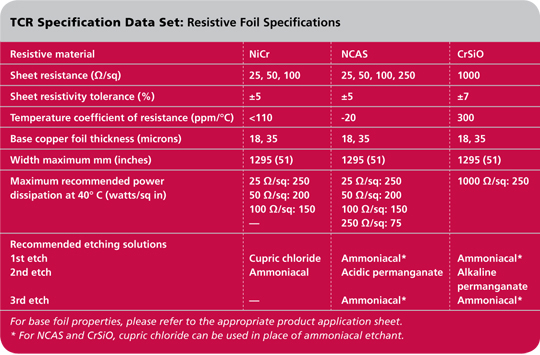 Design Versatility: Nickel chromium (NiCr) and nickel chromium aluminum silicon (NCAS) alloys are available in a range of sheet resistivities, enabling manufacturing of resistor values from 10 to 100k ohms. Product Performance & Predictability: Low thermal coefficient of resistivity minimizes change in TCR foil resistance during lamination. Predictability and consistency lot-to-lot and sheet-to-sheet are ensured through extensive testing under varied lamination conditions. Better Resistor Tolerances: Precision vacuum metallization targets ensure uniform ratios of the elements in the deposited alloy, resulting in minimal resistance variation. Final etch tolerances benefit from TCR’s thin and uniform resistive layer. Reduced Fabrication Steps: When coupled with NiCr, TCR can reduce fabrication steps by eliminating the need for a separate resistive layer etch. Excellent Thermal Stability: There is minimal resistance change after multiple thermal cycles due to NiCr, NCAS and chromium silicon monoxide (CrSiO). Designer and user both benefit from the thermal dissipation properties of TCR foil. For more information, download the TCR brochure. TCR integrated thin-film resistor foil is supplied in a variety of foil widths and thicknesses using Grade 3 copper foil, which exhibits excellent ductility at elevated temperatures and withstands stresses without cracking. Copper thicknesses of 18 µm (0.5 oz) and 35 µm (1 oz) are commonly available. For more information, download the product specifications.